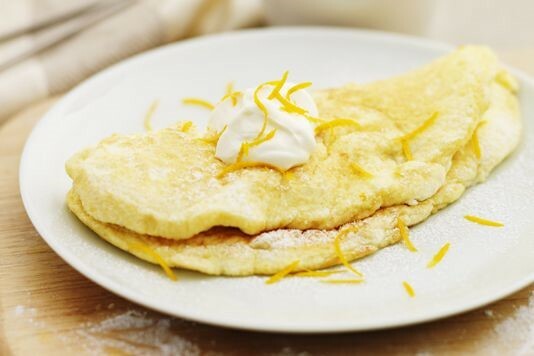 A tasty marmalade and Cointreau soufflé omelette, all made in just 6 minutes. Pre-heat the grill to medium. Whisk the egg whites (Gizzi uses free range) with the caster sugar, until light and fluffy then fold in the egg yolks, marmalade, Cointreau and orange zest. Heat the butter in a heavy-based frying pan. Add the whisked egg mixture and fry until golden brown on the underside. Transfer the omelette in its pan to the grill and cook briefly until the top is golden. Fold the omelette in half and dust with icing sugar. To make the cream whisk together the crème fraiche, icing sugar and Cointreau and serve a dollop with the omelette.